Built in late 2014, the COSL Prospector is a self-propelled, semi-submersible drilling rig designed to operate in water depths of up to 1500m, drilling to depths of 7500m. Designed for North Sea/Norwegian Sea and used in harsh environments, it keeps station using a dynamic positioning by six fixed-pitch variable speed thrusters, or an eight-line mooring system. The authority will take submissions until May 27, then notify a hearing date for its decision-making committee, including whether it will be a public hearing, or a decision released later. "Depending on the outcomes of the exploration drilling, this could include up to three exploration wells and up to seven appraisal wells," the company said. Houston-based Anadarko came up empty-handed following one test hole off Oamaru's coast in 2014, north of the OMV prospects. Given the size of the proposed OMV drilling programme, drilling could begin this year, and - depending on results - run through to the end of 2030. A single test well generally costs at least $US100 million ($NZ148.3 million). OMV has contracted the self-propelled semi-submersible rig COSL Prospector, which another operator, Tamarind, will use first in a Taranaki drill programme. While the coalition Government has stopped issuing any new offshore exploration permits, those acquired before the Government changed can continue under the old regime's regulations. However, once a permit is surrendered, it will not be reissued under the present Government. OMV must commit to drill in the basin by July 2021, or relinquish the permit. OMV said the specific location of wells was yet to be confirmed but the primary target was the Tawhaki structure. If a discovery of commercial volumes of hydrocarbons was made there, up to five appraisal wells could be drilled. 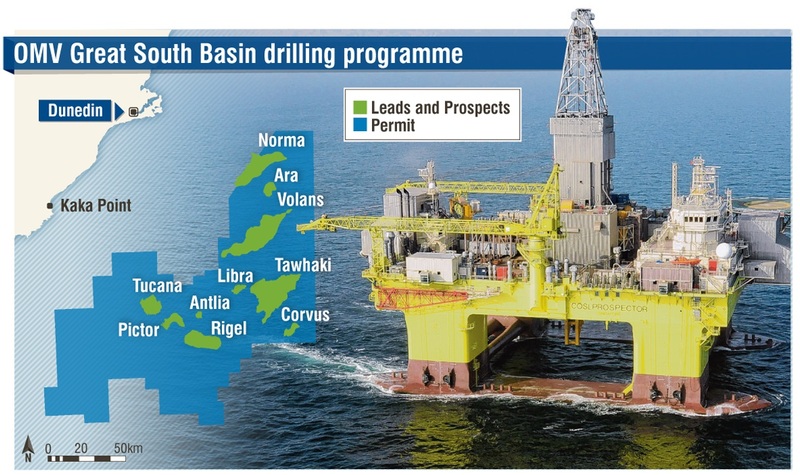 OMV's application said drilling would be in one or more drilling campaigns with possibly different semi-submersible rigs or drill ships used during the exploration permit lifetime, which could be out to late 2030. If the Tawhaki exploration well made a substantial commercial discovery, other geological structures of interest could be explored. The application to "discharge contaminants to sea" covers any residue "trace elements of harmful substances" remaining on deck after any larger spill cleanup. OMV said the amount was "invisible to the naked eye" and "conservatively" about 250ml and would be collected and diluted before being discharged overboard. Its "ecotoxicity risk" to the environment was considered "negligible", OMV said. Great news, I hope they find oil and develop the field. And though the greens will oppose this, even they need to realise that the world still need oil. Electric vehicles, cycles and scooters don't work without oil. People can stick their blinkers on as much as they like, but unlike coal, the world still needs oil. And will do for a long time to come.